Five years after their first mirrorless M-series camera, the sixth generation of the Canon M has arrived — the EOS M6. Boasting similar internal specifications to its sister model, the EOS M5, the EOS M6 features a 24Mp APS-C sensor, Dual Pixel CMOS autofocus, Canon’s latest Digic 7 processing engine, and 1080/60p video. Affordable third-party prime achieves the best scores to date for Sony E-mount lenses. 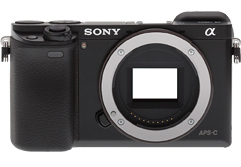 As the current flagship model in the range of Sony’s APS-C format mirrorless cameras, the Sony A6300 is fitted with a newly-developed 24-Mpix APS-C CMOS sensor and BIONZ XTM processor. With a native ISO range up to 25,600 and continuous shooting at up to 11 fps, along with 4K video, the A6300 offers a wide range of capabilities in a small package. Read on to find out how well this model’s new sensor performs. Another Sony lens that’s not new, exactly, but one we’ve been asked in our forums to review is the Sony E PZ 18-105mm F4 G OSS. Featuring the maker’s G moniker indicating high-end construction, this stabilized 28-164mm equivalent has been designed for the maker’s APS-C format mirrorless models and is an intriguing addition to the lineup. Read on to find out how well this model performs. Launched in July 2015, the $1,198 GX8 is Panasonic’s latest Micro-Four-Thirds mirrorless hybrid camera. Announced as an update to its predecessor, the GX7, the GX8 becomes the highest-resolution Micro-Four-Thirds offering in the Panasonic lineup, featuring a 20Mp Live MOS sensor. Packing a 28.2Mp BSI CMOS sensor, the Samsung NX500 is one of the highest-resolution APS-C hybrids cameras currently available. Wasting no time after posting scores for its sister model, the NX1, our latest review analyzes the stats and scores for the NX500. Aimed at enthusiasts, Canon’s latest iteration of the mirrorless M-series contains the new 24.2-Mpix APS-CMOS sensor and Hybrid CMOS AF III 49-point AF system found on the EOS 760D (Rebel T6s) and 750D (T6i). There’s also an articulated touchscreen LCD and built-in Wi-Fi with NFC, but it’s still not officially available in North America. Read on to find out how well this new model’s sensor performs.